If you are a first-time chainsaw buyer, you probably have a lot of questions. What type of chainsaw should I get? What size guide bar is right for me? What features should I look for? Which is the best electric chainsaw? How much is a chainsaw going to cost? Choosing the right model can be a little overwhelming if you have never owned a chainsaw before. Here is a quick guide for people that are considering buying one of these tools. Choose between gas, electric, and cordless chainsaws based on its intended use, consider the common features of the tool that you can come to expect, and understand what contributes to how much a chainsaw costs. When people talk about different types of chainsaws, they are often referring to the power supply. You can choose between gas-powered engines and corded electric models, or you could decide to go with a cordless battery powered chainsaw. Each different type has its own pros and cons, and selecting the right one usually comes down to where and how you intend to use the chainsaw. Gas powered models tend to offer faster chain speeds, more cutting power, and increased mobility. They are also louder, heavier, and usually generate more vibration when in operation. In addition to that, the gas motor tends to require more maintenance than a cordless battery powered chainsaw. You can generally find lightweight gas chainsaws that are good for residential use. These models would usually have a guide bar of about 16-18 inches. However, there are also professional-grade chainsaws that have more power and come with guide bars of 20 inches or more. Corded electric chainsaws offer a little less power than the gas-powered models, but can be a great option for most residential users. They are usually lighter, easier to maintain and start, and generate far less noise and vibration. The main limitation of these models is that your work area is determined by the length of your extension cord. If you want the best electric chainsaw that can handle a wide range of cutting jobs, the 15 Amp Electric 18” Chainsaw is a good bet. At 15 Amps, it has plenty of power for most residential purposes. It also features an 18” guide bar, giving it a wide cutting diameter. Additional features include automatic chain tensioning, automatic oil lubrication, and a built in chain brake. The best battery powered chainsaw will offer good mobility and is usually lightweight and easy to handle. Most cordless chainsaws tend to have less power than electric or gas powered models, and they often have guide bars that are in the range of 10-12 inches. With less power and smaller guide bars, a battery powered chainsaw tends to be good for lighter duty like pruning and cutting small branches. You also have to consider the battery life and the possibility that your battery powered chainsaw may need to be recharged before you are done your work. If you are looking for the best battery powered chainsaw, the 40V 12” Cordless Chainsaw With Auto-Tension has a lot to offer. It is lightweight and easy to handle, and with its 40V battery, it still wields impressive power for a cordless chainsaw. The tool also has automatic chain lubrication and tensioning, making it very easy to maintain. You could also consider a unique tool like the JawSaw. It is a light-duty machine, but the JawSaw offers unparalleled safety and ease of use. With the JawSaw design, the saw retracts back into the housing when no cuts are being made, and the blade is fully covered by the jaws to prevent accidents. When purchasing the JawSaw, you also have the option of buying a corded electric model or one that runs on battery. Guide bar length: The guide bar length determines how wide the chainsaw will cut. A longer guide bar provides the ability to make wider cuts. Automatic chain oiler: Chain lubrication is an important part of both safety and efficiency. With an auto chain oiler, the chain stays lubricated so the user doesn’t have to keep stopping to manually press an oiling plunger. Chain brake: The chain brake stops the chain in the event of kickback. If there is a sudden force, the front hand hits the guard, engaging the brake. Tool-free chain adjuster: This allows the user to adjust the chain with a hand-operated mechanism. It makes it quicker and easier to make adjustments to the chain tension. Spring-assisted starter: This reduces the amount of force needed to start a gas-powered chainsaw. If you are buying an electric or cordless chainsaw, you do not need to worry about this feature. With most of these chainsaw models, starting is as simple as pulling a trigger. The final point is cost: how much is a chainsaw? The price can vary significantly depending on the type of chainsaw and the features it includes. At the highest end, you have the professional grade gas-powered chainsaws with longer guide bars. For a more affordable options, you should consider a corded electric chainsaw. The following are rough estimates of the price range for different types of electric and battery powered chainsaws. When it comes to picking the best battery powered chainsaw or corded model for your needs, it’s important to consider all of the above factors. With a bit of foresight and understanding of how you will be using the tool, you can find the tool of your dreams, whether that’s a JawSaw, battery powered model, or electric chainsaw. Now that you know what to look for in a chainsaw, get the best one for your needs. 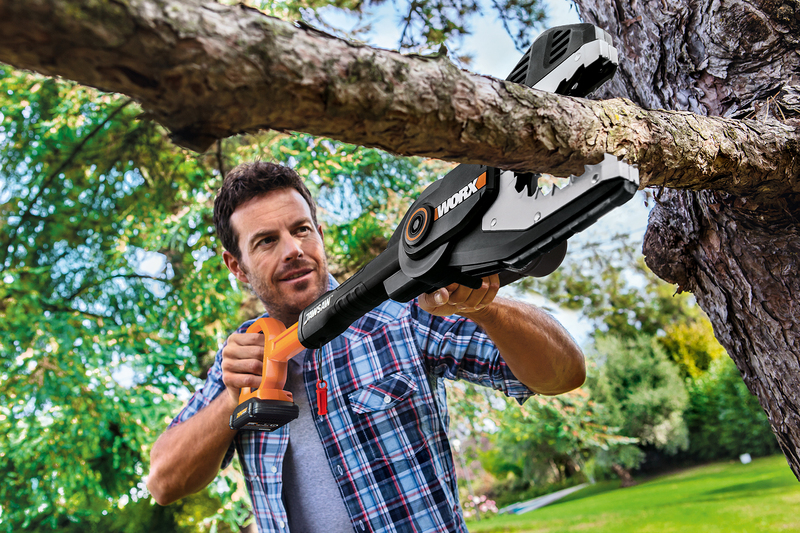 Shop the Worx collection of chainsaws. Choose between gas, electric, and cordless chainsaws based on its intended use, consider the common features of the tool that you can come to expect, and understand what contributes to how much a chainsaw costs. How to Get Rid of Standing Water in Your Yard How to Seed a New Lawn in Autumn Which Saw Should You Use for Your Next Project?